The Mat is 12.5" x 39" / 32 x 99 cm. It is made of PU (Polyurethane) leather. Our PU Leather is vinyl free and platelet free. The Mat is 12.5 x 39", and made from leatherette. No connection cord supplied. or work. It measures 18 x 36 inches. 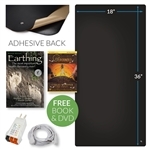 Earthing Yoga and Fitness Mat Kit.